I just got back from my 10‐day solo trip to the States, so I know it’s hot back home (sadly, the same can’t be said of Ireland). If you can bear to turn on your oven for 45 minutes, then this is an easy way to use up an abundance of tomatoes now that they’re coming into season. It’s like a summertime version of Donal Skehan’s oven‐roasted sausage and sweet potato recipe. It’s also incredibly easy to pull together and doesn’t take much prep work or thinking about — just right for when your head is still spinning from jet lag, a hard day at work or a long day taking care of the kids. I like to serve this with a green salad with balsamic vinaigrette and plenty of crusty bread to mop up all the juices. *The competition has now closed. Congrats to Kathy, who likes the warm tofu with spicy garlic sauce! Jamie suggests chopping up any leftovers to make into a chunky pasta sauce for penne or rigatoni, and I can vouch that it’s good. If you like this dish, you’ll also like balsamic roast chicken with rocket, roast tomatoes and Parmesan. Place the tomatoes, herbs, onions, garlic and sausages in a large roasting tray or casserole dish, one that can more or less fit all the tomatoes in one layer (or you could do individual casserole dishes, like I did in the photo, or divide everything between 2 trays/dishes if you don’t have one that’s big enough). Drizzle well with extra virgin olive oil and balsamic vinegar and season with salt and pepper, then make sure the sausages are on top. 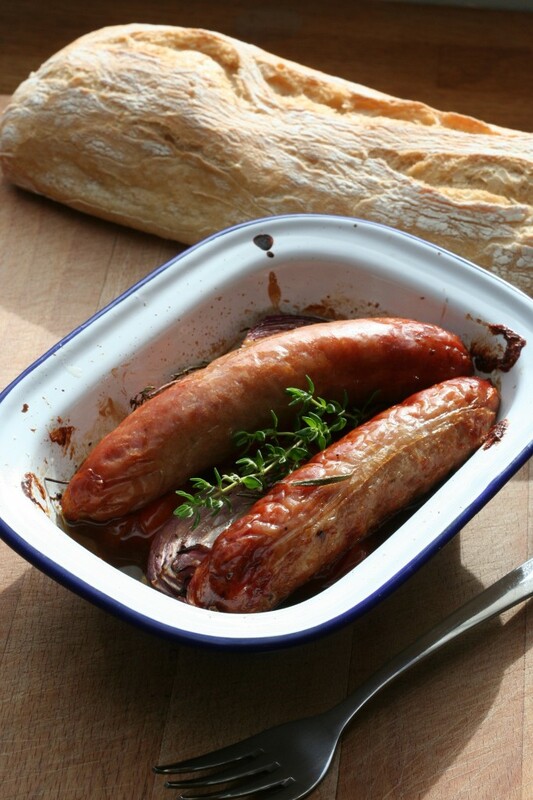 Roast in the oven for 30 minutes, then give the tray a shake and turn the sausages over. Continue cooking for 15 to 30 minutes more, depending on how golden and sticky you like your sausages. If you think the sauce is a little too thin once the sausages are done, lift them out and place the tray on the stovetop to cook it down to the consistency you like, then put the sausages back in. Check the seasoning and serve either with a good crusty bread (great for mopping up the sauce! ), mashed potatoes, rice or polenta, a green salad and a nice glass of wine.